DEAR BUYERS! WE UPDATED OUR SITE! 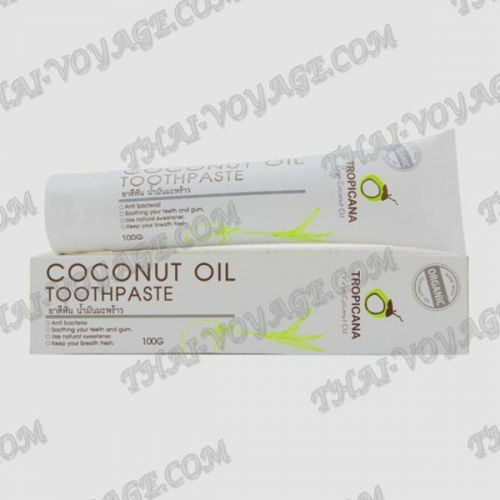 Tropicana toothpaste based on coconut oil is great for teeth and oral cavity. This is a real find that will give your teeth maximum health and whiten the enamel. The product is characterized by antibacterial, softening properties, counteracts the development of a whole range of diseases, fights current ailments. The rich composition of this paste makes the gums stronger, effectively helps in the treatment of mucosa, relieves excess bleeding gums, hypersensitivity, contributes to the disappearance of ulcers and bad smell. The composition of the paste is carefully balanced, so that the enamel is bleached carefully. The composition of toothpaste also includes: juice from the stems of aloe Vera, juice from the leaves of guava, peppermint oil, extract from the leaves of stevia. There are no such foaming chemical agents as sodium lauryl sulfate in the composition. Forget about plaque and unpleasant tooth color after drinking wine, juice, tea, coffee. The paste will be useful even for those who like to smoke – they can feel the difference before and after the application, while the bleaching effect remains for a long time. Toothpaste refreshes and disinfects the oral cavity, preventing the growth of bacteria and the deposition of Tartar on the teeth. Cleans teeth from dark spots caused by frequent use of coffee and strong tea. At the same time it is not abrasive, does not erase tooth enamel. 2013 - 2019 © THAI VOYAGE Online store . All rights reserved.